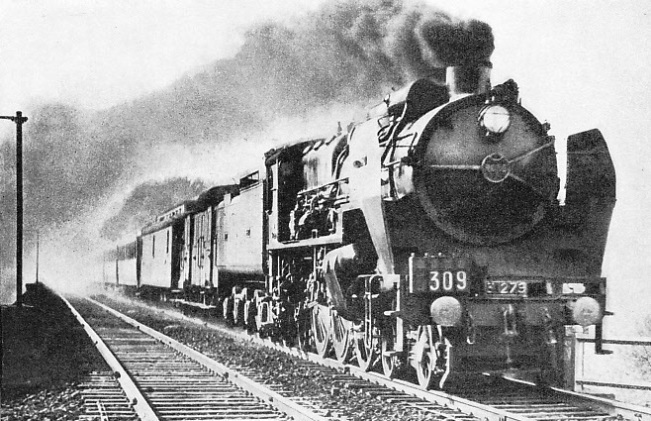 THE SUPER-PACIFIC TYPE of engine introduced from Paris to Arras and Lille on the Northern Railway of France to handle heavy trains at high speeds. The photograph shows one of these locomotives hauling an express at seventy-five miles an hour. The distance of 119.5 miles is covered by the fastest train in 116 minutes. Note the shields that serve as smoke deflectors. A STUDY of present-day railway time-tables makes it tolerably clear that in the race for higher railway speeds Great Britain, which once held a commanding lead, is gradually being left behind. The average speed and frequency of British main line services, taken as a whole, is still considerably higher than on the mainland of Europe generally, but it is doubtful if this superiority any longer obtains in comparison with France and Germany. When it comes to the quickest long-distance services, the advantage definitely rests with the mainland, though this fact is not generally known in the British Isles. To a certain extent this Continental advantage now lies in the extensive use of high-speed rail-cars, which for the most part do not give the passenger the same amount of room, nor the full restaurant-car accommodation, of an ordinary steam-hauled express, but steam has also made great strides on the Continent, particularly in France. The usual reply, when these facts are adduced, is to claim that travelling in French express trains is “dangerous”. Those who make it are out of touch with modern developments. Doubtful reputations are hard to live down. There can be no dispute that for a time after the war of 1914-18 the frequency in France of accidents to fast trains was extremely high. The acute shortage of man-power during the war years left the French main lines in a deplorably bad condition, to which fact not a few serious derailments must be attributed, as soon as attempts were made to restore pre-war speeds. Since then, however, the situation has completely changed. Tracks have been relaid with heavier rails - the new standard PLM rail, for example, weighing 126 pounds to the yard, is considerably heavier than any railway rail section used in, for example, Great Britain - and have been put in first-class order. A journey such as that of the boat train services of the French Northern Railway between Calais and Paris can compare in smoothness with the best of railway travel anywhere in the world. In other ways the French railways are even in advance of those in Great Britain. Every express locomotive in France that is used on important services is fitted with a self-recording speed indicator. 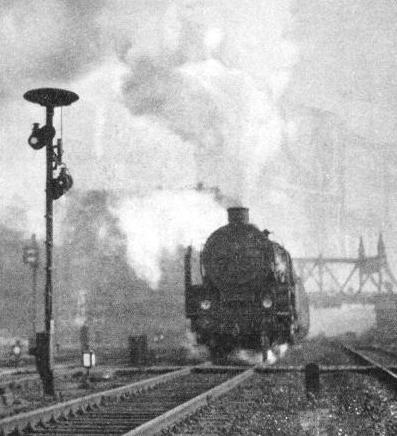 Not only is the speed of his train at any given point thus made apparent to the driver - a matter which in Britain, with the exception of a very few locomotives, is left to driver’s own judgement - but also the rate of travel throughout the journey is recorded on a moving roll of paper, with which the driver is unable to tamper, thus giving an exact picture of the speed of his train at all points where, for curves or other reasons, speed is restricted. His observance of the general maximum speed limit - which for steam trains on all French lines is fixed at 120 kilometres (75 miles) an hour, or any of the lower limits that are imposed over certain stretches of line is also thus kept under review while the train is running. 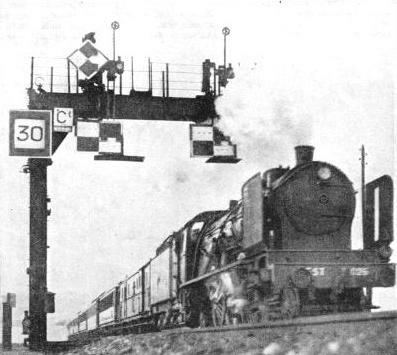 Furthermore, the system of repeating audibly in the engine cab the position of the signals, and the automatic application of brakes should a signal be passed at danger - such as is in use on the main lines of the English Great Western Railway - is now the customary practice all over France. Adverse signal indications are also marked on the speed indicator roll, but the driver is provided in the cab with a “vigilance button,” with which he is able to mark the roll before the signal indication is made, so showing that throughout the journey he is unceasingly on the alert. Similar systems prevail in Germany and in other European countries. GETTING UP SPEED with a heavy German express hauled by one of the latest “Pacific” engines. Locomotives of this type are used on the fast runs between Berlin and Hamburg, Berlin and Cologne, and Berlin and Frankfurt. It cannot be claimed, of course, that these precautions have brought all railway accidents to an end, and the French have certainly had their share, even during recent years. But within the last decade there have been years in which the French immunity from railway accidents has been just as high as in Great Britain - a remarkable and praiseworthy change from the conditions which prevailed immediately after the war. The thoroughness and efficiency of the Germans are in themselves an adequate safeguard against accident, and it is very seldom that we hear of any serious railway disaster on German territory. In considering the high speeds abroad that are now to be detailed, the reader should always keep in mind the maximum speed limitation to 75 mph that has just been mentioned. To maintain a high average speed in such conditions - as compared with the maxima of 80 to 90 miles an hour that are now common in the British Isles - a more uniform speed of travel is needed. 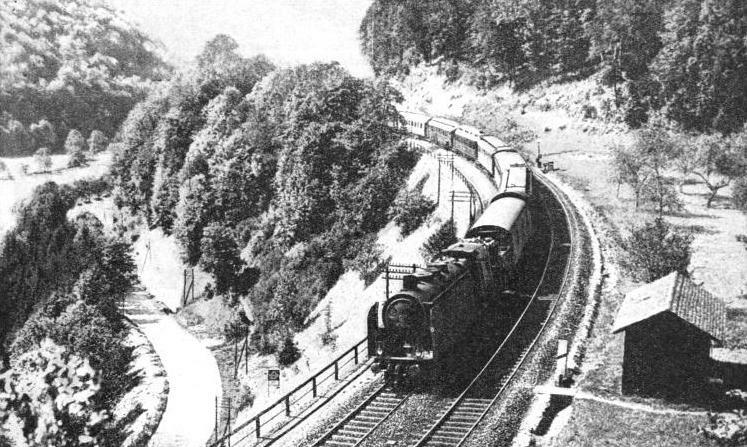 This in its turn involves much higher uphill speeds and harder locomotive work. With the exception of one or two main routes - such as Berlin-Hamburg, where the signalling and the super-elevation of the track on curves have been altered to permit of higher speeds - the same limit of 75 mph for steam-hauled trains obtains in Germany and Belgium; but in most other countries the maximum permissible does not exceed 100 kilometres (62 miles) per hour. With the rail-cars, however, considerably higher speeds are permitted. These comparatively light vehicles are so efficiently braked that they can be brought to rest from the highest speeds in a very short distance. Thus between Berlin and Hamburg, Berlin and Hamm (Westphalia, on the Berlin-Cologne route), and Berlin and Leipzig, maximum speeds up to 160 kilometres (100 miles) an hour are permissible. In France the maximum for the Bugatti rail-cars of the PLM and State Railways, running on the Paris-Lyons, Paris-Havre, and Paris-Deauville routes is generally fixed at 140 kilometres (87 miles) an hour. The fastest start-to-stop railway schedules in the world are now operated in Germany. For the first time in history bookings from start to stop at over eighty miles an hour have, from May 15, 1935, figured in railway timetables. Even the “Flying Hamburger” has been left behind by some of the point-to-point timings of the 1935 Berlin-Cologne and Berlin-Frankfurt rail-cars. From the Zoological Gardens Station, at Berlin, to Hanover, the Cologne car is booked over the 157.8 miles in 115 minutes, at a speed of 82.3 miles an hour, and at the time of writing, this is the world’s fastest railway run; in the reverse direction 121 minutes are allowed for the same distance. Similarly the Frankfurt car is allowed only 76 minutes for the 102.2 miles from Leipzig into Berlin, which works out at 80.8 miles an hour, and 77 minutes in the opposite direction. In all, as is revealed in the accompanying table, German rail-cars are responsible for making the twelve fastest railway runs in the world, all of them ranging in speed from 75 to 82.3 mph between starting and stopping. 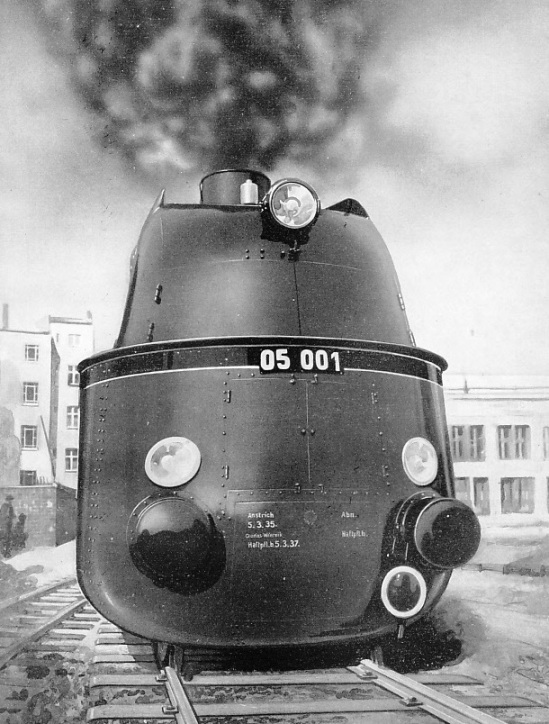 119 MILES AN HOUR was attained on a trial run by this new German streamlined locomotive, built by the Borsig locomotive works. The 4-6-4 engine has three cylinders 17½ -n diameter by 26-in stroke, driving wheels of the exceptional diameter of 7 ft 6½-in, a heating surface (including superheater) of 3,723 sq ft, a grate area of 50¾ sq ft, and a working pressure of 284 lb per sq in. The tender holds 9¾ tons of coal, and 8,140 gallons of water. Engine and tender weigh 209 tons in running trim. The idea underlying these services is to provide the German business man with travel between the principal German cities of so rapid a description that he is able to make lengthy journeys, transact his business in a distant city, and return home without having had to stay away overnight. The service is thus arranged so that the best use may be made of working hours, and an early start is inevitable. Thus the Cologne-Berlin rail-car leaves Cologne at seven in the morning, reaches Berlin (Zoo) ten minutes after midday, and Friedrichstrasse ten minutes later; starting back at 7.11 pm, it reaches Cologne at eighteen minutes after midnight. The distance between Berlin (Zoo) and Cologne via Dusseldorf is 359 miles, and it is covered. with six intermediate stops, in 5 hours 10 minutes in one direction, and 4 hours 57 minutes in the other. Then there is the Frankfurt car, running over a much more difficult route, from the grading point of view, which starts at 6.40 am, reaches Berlin at 11.46 am, starts back at 6.24 pm, and arrives at 11.29 pm. It covers a total distance of 671 miles there and back, with two intermediate stops in one direction and three in the other, in an aggregate running time, stops excluded, of 598 minutes. The Munich car, which has to come through mountainous country between Nuremberg and Leipzig, sets out at 6.31 am, reaches Berlin at 1.20 pm, starts back at 5.5 pm, and arrives home six minutes before midnight; the total daily distance covered in this instance is just over 837 miles. The remaining two rail-cars are the famous “Flying Hamburger,” and a new cross-country service from Cologne to Hamburg and back, which runs a distance of 280 miles in either direction, in 4 hours 18 minutes northbound and 4 hours 6 minutes southbound, with seven intermediate stops. Since the fastest previous time with steam was 5 hours 32 minutes over this route, the advantage conferred by the rail-car is obvious. In France, as already mentioned, maximum speeds over suitable stretches of line are limited, with the rail-cars, to 87 miles an hour, so that the overall speeds are not quite so high as those of Germany. The French railways specialise in Bugatti units for the high speed services, and the State Railways have been responsible for the most energetic developments in this direction. It is on the Paris-Havre main line that the fastest bookings are in force. Twice daily in either direction a Bugatti rail-car covers the 141.5 miles between Paris and Havre in two hours, at an average speed of 70.8 mph, including a stop at Rouen. The quickest point-to-point time is from Havre to Rouen, a distance of 54.9 miles, which, though it includes - singularly enough - the longest and steepest climb on the route, is covered in 45 minutes, at a start-to-stop average of 73.2 miles an hour. A CHARACTERISTIC SCENE on a French main line, showing typical “chess-board” signals, and one of the Eastern Railway’s express trains at speed on the way from Paris to Nancy and Strasbourg. The Paris-Nancy run of 219 miles is the second longest non-stop journey on the mainland of Europe, and the fastest express covers the distance - in the up direction - in 216 minutes. During the height of the summer season the État also has its big first-class Bugattis running twice daily in the even two hours between Paris and the popular seaside resort of Trouville-Deauville, 136.2 miles away, maintaining an average of 68.1 miles an hour over a route with heavy gradients, and several severe slowings for curves. An innovation is a new cross-country rail-car service from Dieppe to Nantes and back, over a most intricate route, which nevertheless contrives to maintain a mile-a-minute average for over 300 miles, notwithstanding numerous intermediate stops and slowings. 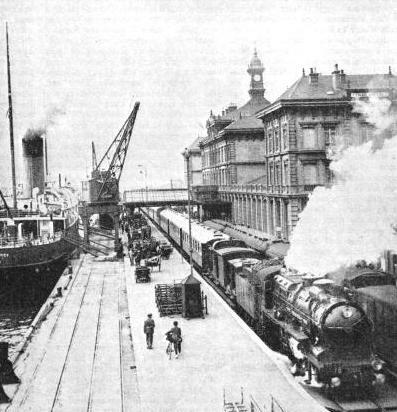 Connecting at Nantes with the “Côte d’Emeraude-Pyrénées” express, and at Dieppe with the steamers from and to Newhaven, this rail-car thus furnishes a new and fast connection between England and the south-west of France. The PLM Company runs an express rail-car every day from Paris to Lyons and back, covering the 317.3 miles in 4 hours 50 minutes either way, inclusive of stops at Laroche and Dijon. The fastest run made by this car is from Dijon to Laroche, a distance of 99 miles, which is covered in 83 minutes, at an average of 71.6 miles an hour. During the height of the season a similar car is operated between Paris and Vichy, the famous spa, over the difficult Bourbonnais route. The Northern Railway of France has a motor-driven three-car train, which starts daily at Turcoing and comes into Paris by way Of Lille, Douai, Arras, and Amiens, at all of which stops are made. By the narrow margin of two minutes the time of 2 hours 40 minutes for the 160 miles between Paris and Lille is the quickest of the day, though it includes the diversion into and out of Amiens, not normally made by steam-hauled express trains over this route. In other European countries, also, the inauguration of rail-car services has enabled entirely new standards of railway speed to be set up. In Denmark, for example, the introduction of new Diesel cars in 1935 has introduced into the time-tables the first mile-a-minute runs in that small country. One of these cars makes the run of 38.3 miles between Roskilde and Slagelse in 38 minutes; another runs the 123.1 miles from Aarhus to Nyborg in 124 minutes (the first non-stop run exceeding 100 miles in length yet staged in Denmark); two more cover the 68.4 miles from Copenhagen to Korsör in 69 minutes; the 55.5 miles from Fredericia to Nyborg are run in 56 minutes; and so on. Coupled with the opening of the magnificent bridge spanning the Little Belt, which has done away with one of the numerous train-ferry crossings, these rail-cars have made possible some very substantial cuts in Danish train times. Poland is another country in which fast rail-car services have been introduced on an extensive scale during 1935, in many instances making mile-a-minute runs between stops. For example, the 197.5 miles between Warsaw and Katowice are covered daily in 191 minutes one way and 190 minutes the other, including five intermediate stops; the fastest start-to-stop booking is timed at 69.6 mph. 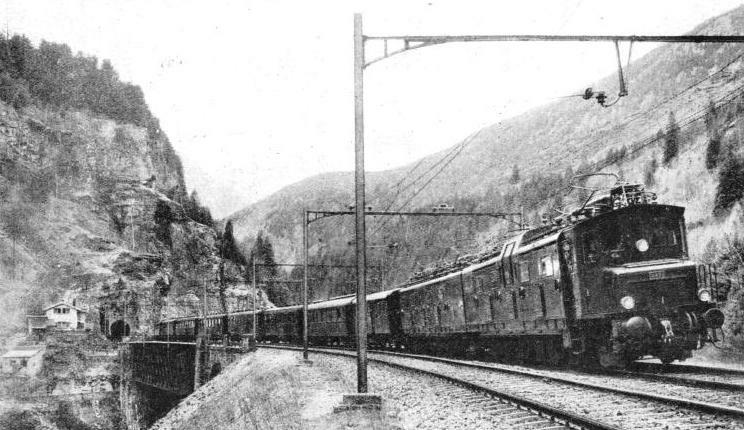 AN ELECTRICALLY HAULED EXPRESS on the St. Gothard line. The locomotive shown is one of the most powerful in existence, and develops 8,500 horse-power. The average speed of 40 miles an hour with heavy trains over the 1 in 38 gradients of the St. Gothard route is probably the highest speed in the world over such steep inclines. But the achievements of steam on the mainland of Europe are just as meritorious in their realm, and, indeed, even more so, in view of the enormous weight of train that the steam locomotives are often required to haul at high speeds. Pride of place in this respect must be given to the Northern Railway of France, whose reputation to provide - taking a general average, and relatively to the size of the system concerned - the fastest express train services in Europe, if not in the world, is still well maintained. Over each of its three important main lines out of Paris it is possible to travel by Nord express trains at speeds exceeding sixty miles an hour from start to stop. In 1935, for the first time in history, the capital cities of France and Belgium have been brought within three hours of each other by rail. It is the luxurious “Blue Bird” Pullman express that is so booked, and the distance of 193.1 miles demands an overall average of 64.3 miles an hour. But as there are some heavier gradients on the Belgian side of the frontier, the speed on the French side must be higher; so Aulnoye, 133.9 miles from the start at Paris, has to be cleared in 119 minutes, at an average speed of 67.5 miles an hour. In the reverse direction the same train is allowed four minutes more, to allow for delay in connection with heavy engineering works in the last five miles from Joncherolles into Paris, which are likely to interfere with the running for some time to come. The “North Star” Pullman also makes the non-stop run between Paris and Brussels, but at a slightly lower speed, so that there are four daily non-stop journeys this course of 193.1 miles. The remarkable rebuilt “Pacific” locomotives recently transferred from the Paris-Orleans to the Nord Company are used on these services. The longest non-stop run on Nord metals, however, uses the same main line from Paris as far as Maubeuge, but from there continues north-eastwards through Charleroi to Namur and Liége, over the lines of the Nord-Belge company, which are Nord property. Four times daily, twice in either direction, the 226.7 miles between Paris and Liége are spanned without intermediate stoppage, and this is the longest non-stop run in any country other than Great Britain. The achievement is all the more remarkable in that water-troughs are not installed on this route, so that the tenders of the engines must carry sufficient water to suffice for nearly four hours’ strenuous locomotive work. Two of the trains concerned make the run in 3 hours 50 minutes, involving an inclusive average of 59.1 miles an hour, but again slower running is required on the Belgian than on the French side of the frontier, so that the booked speed over the 147.7 miles between Paris and Jeumont is as high as 65 miles an hour. The other Paris-Liége non-stop runs are made by the “Nord Express” - one of the famous European luxury trains - which carries through sleeping-cars between Paris, Cologne, Berlin, Riga, and Warsaw and between Paris, Hamburg, and. Copenhagen. Despite its very substantial load it reaches Liége in 3 hours 56 minutes. Many other strikingly fast runs are made over this main line of the French Northern Railway. To St. Quentin, for example, although the distance from Paris is 95.1 miles, the time-tables show heavy express trains booked in 88, 90, 94, and 95 minutes. These timings demand first-class locomotive performances. THROUGH THE BLACK FOREST. In Germany the “rule of the road” is to keep to the right, as shown in this picture of a modern express. Though the regular steam-hauled trains of Germany do not hold the speed record, its Diesel rail-cars operate the fastest non-stop schedules in the world. Certain of the boat services between Calais, Boulogne, and Paris, also, are very fast. Pride of place for speed is taken by the evening service from Paris by the Boulogne-Folkestone route, which leaves Paris at 4-30 pm, and is scheduled to cover the 140.5 miles to Etaples in 132 minutes, at an average of 63.9 miles an hour. 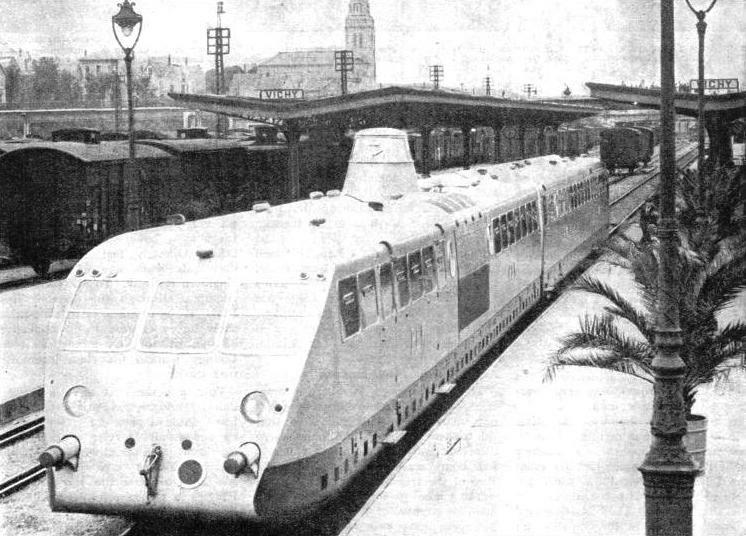 The “Golden Arrow”, carrying in its formation not only the Calais-Paris Pullmans, but also the “Blue Train” sleepers for the Riviera and the Simplon-Orient cars for Trieste and Istanbul, is allowed 193 minutes to run the 184.1 miles from Calais to Paris. All Paris-bound expresses from Calais are faced with the arduous climb out of Calais up to Caffiers, seven miles at 1 in 125, a dead slowing through Amiens, and finally the lengthy 1 in 200 ascent from Creil up to Survilliers. The northbound “Golden Arrow”, which is a lighter train, has its Paris-Calais time cut to 187 minutes, and most of the other boat trains are equally or but little less speedy. At times of pressure loads up to 550 tons or so are common between Paris and the coast, and on certain of the trains loads are allowed to rise to 650 tons. Engines of the powerful compound “Super-Pacific” Nord type are generally used; without their tenders they weigh 96 tons apiece, or almost exactly the same as the “Super-Pacifics” of the London and North Eastern Railway. Next in speed order among the French railways comes the Paris-Orleans-Midi - an amalgamation of the previous Paris-Orleans and Midi Railways. On this system the “star turn” in the matter of speed is, of course, the famous “Sud Express”. Between Paris and the Spanish frontier at Irun this is an all-Pullman train; beyond, the difference in gauge between the 4 ft 8½-in of France and the 5 ft 5¾-in of Spain compels a change from the Pullmans to a sleeping-car express, but the speed on the Spanish side of the frontier is far lower than on the French. Between Paris and Bordeaux this is probably the fastest steam-hauled train in the world for the distance covered. The first two stages of the journey, from Paris (Quai d’Orsay) at 11.30 am to Orleans (Les Aubrais), and from there to Tours (St. Pierre-des-Corps), are achieved with electric haulage - 76.2 miles in seventy-three minutes, followed by 69.5 miles in sixty-two minutes. From there to Bordeaux one of the famous rebuilt “Pacifics” of the Paris- Orleans takes charge, and covers the 62.8 miles from St. Pierre-des-Corps to Poitiers in fifty-nine minutes. The next stage is the fastest steam-hauled run on the mainland of Europe, and takes second place in Europe only to the “Cheltenham Flyer” - seventy miles from Poitiers to Angoulême in precisely one hour. Then comes a run of 83.5 miles from Angoulême to Bordeaux in eighty-seven minutes, allowing a little margin for the recovery of any lost time. Thus the 365 miles from Paris to Bordeaux are completed in an overall time of 349 minutes, or, if the nine minutes spent at the four intermediate stops be deducted, in a running time of 340 minutes. Once again electric haulage begins, now continuing to the Spanish border, and even as far as Dax, 456.7 miles from Paris, the overall average of a mile a minute has still been maintained; for the time of arrival is 7.6 p.m., 456 minutes after leaving Paris. After that the stops are more numerous. PLM RAIL-CAR AT VICHY, in central France. Rail-cars of this type, allowed to run at speeds up to eighty-seven miles an hour, also operate between Pans and Lyons. The 317.3 miles are covered in four hours fifty minutes, inclusive of stops at Laroche and Dijon. On the northbound “Sud Express” the timing of six hours twenty-five minutes from Bordeaux to Paris (Quai d’Orsay) is considerably easier, but it allows a margin for recovering the late starts which frequently result from the late arrival of the Spanish connection. Early in 1935 an astonishing record was created by the recovery of precisely one hour between Bordeaux and Paris alone, whereby the 359.6 miles from Bordeaux to Paris (Austerlitz) were covered, stops included, in five hours sixteen minutes. Two other very fast trains leave Paris fur Bordeaux at 5.25 pm, and Bordeaux for Paris at 5.15 pm, both are allowed six hours twenty minutes (the latter to the Austerlitz station in Paris). The northbound of these is thus only four minutes slower than the “Sud Express” itself, though a much heavier train, especially between Tours and Paris. There are numerous other mile-a-minute runs over this important Paris-Orleans main line. Another famous P.O. train is the “Barcelona Express”, which runs down through central France, via Toulouse and Narbonne, to the Spanish frontier at Port Bou. The heavy gradients and sharp curves of the route forbid the high speeds Bordeaux route, but the average of about 47.2 miles an hour over the 445 miles from Paris to Toulouse is most praiseworthy, seeing that the weight of this train often exceeds 600 tons. Electricity is responsible for the haulage for the first 313 miles of the journey from Paris to Brrive-la-Gaillarde, and the initial 127.3 miles from Quai d’Orsay to Vierzon, is covered without a stop - the longest non-stop P.O. run - in the excellent time of 132 minutes. The principal long-distance rival to the “Sud Express” of the Paris-Orleans is the “Côte d’Azur Pullman” of the PLM - another of France’s all-Pullman luxury trains. It is only in the winter and spring season, when fashionable Europe is migrating to the Riviera, that this famous express operates its spectacular schedule. “THE GOLDEN ARROW” PULLMAN EXPRESS about to leave Calais (Maritime) on its non-stop run to Paris. The distance is 184 miles, and in the Paris-Calais direction is covered in 187 minutes, despite the long climbs over the summits at Survilliers, Gannes, and Caffiers, and the slowing through Amiens. Leaving the Gare de Lyon at 10.15 am, it makes a whole series of mile-a-minute runs in succession. Stopping at Laroche, Dijon, Lyons, Valence and Avignon, it covers the intermediate stages of 96.2, 99.0, 122.1, 65.8, 77.3 and 74.2 miles in 94, 101, 117, 74, 71 and 79 minutes respectively, completing the 534.6 miles to Marseilles, inclusive of these stops, in nine and a quarter hours. Along the 155 miles of the Riviera coast the gradients are extremely steep, and the stops are frequent, so that this triumphant speed progress is brought to an end; the journey concludes at Mentone, 689 miles from Paris, at 11.15 in the evening. On the return journey the “Côte d’Azur Pullman” leaves at 9.20 am, makes the same stops, and is back in Paris at 10.35 the same evening. On all the other three French railways - the Eastern, the Alsace-Lorraine, and the State - high-speed steam-hauled runs may also be found. One express which is worked at high speed along the whole length of the Alsace-Lorraine main line is the “Edelweiss Pullman”; this is easily, in fact, the quickest stretch of its daily journey between Amsterdam and Basle. Coming south. it connects the historic cities of Metz and Strasbourg in a time of eighty-nine minutes, the distance being 95.6 miles, and continues from Strasbourg to Mulhouse, 67.3 miles, in sixty-two minutes. In the other direction the time allowed is sixty-one minutes from Mulhouse to Strasbourg. and ninety-two minutes from there to Metz. The speeds on the Eastern have rather declined from the best standards of earlier years, but one reason at least is that reduced traffics have compelled the amalgamation of trains into very heavy formations, with frequent stops. Nevertheless, some fast runs are still left. The 7.28 am express from Strasbourg to Paris, for example, covers the 219 miles from Nancy to Paris without any intermediate stop in 216 minutes, arriving in the French capital, 312.2 miles from Strasbourg, at 12.45 pm. In the other direction the 9 am from Paris to Strasbourg, carrying through coaches for Vienna, is allowed no more than 156 minutes in which to make the 157.5 miles to Bar-le-Duc. As to the State Railways, their principal speed efforts with steam are over the same course - Paris to Havre - as that on which the Bugatti rail-cars make their records. Three of the expresses running from Havre to Paris, and one in the reverse direction, cover the 86.6 miles between Rouen and Paris in 83 minutes. Over the other main lines of the État, which serves nearly the whole of the French resorts on both the Channel and Atlantic coasts, the express trains, though not so speedy as those already mentioned, grow to colossal dimensions during the height of the season, and there are records of loads between 800 and 900 tons having been hauled without assistance by the big 4-8-2 locomotives over heavily graded routes with many slacks. The steam-hauled services of Germany now require mention, and some of them are noteworthy. Of them the quickest are those classified as “F.D.”, which are confined to the use of first- and second-class passengers, and command a supplementary charge over and above the ordinary fares. The records for steam in Germany are held by the Berlin-Hamburg route, 178.1 miles in length, which is spanned in 154 minutes - 69.4 miles per hour average - by the 6.7 pm “Diner” from the Lehrter Station. A corresponding breakfast-car express leaves Hamburg at 7-25 in the morning and reaches Berlin at 10.2 am, so taking 157 minutes. The route is practically level and the only hindrance to speed is the half-way slowing to thirty-seven miles an hour through the junction at Wittenberge. Incidentally, these were the first two expresses in the world to afford the business man the convenience of being able to communicate, by wireless telephony. with his clients in either city while travelling at full speed between them. All the other expresses over this route are very fast, and their scheduled start-to-stop speeds are commonly in the region of 60 miles an hour. Speeds of “F.D.” trains on the Berlin-Cologne main line are also high. The saloon car express from Hook of Holland, in connection with the London and North Eastern steamer service from Harwich, is taken over the 157.8 miles from Hanover into Berlin in 150 minutes, and the midday express from Cologne takes one minute more, preceded by an allowance of 110 minutes for the 109.6 miles from Hamm to Hanover. Corresponding trains in the opposite direction run the Berlin-Hanover length of 157.8 miles in 155, 159 and 160 minutes, and two of them continue over the 109.6 miles to Hamm in 102 and 106 minutes respectively. Similar speed exploits take place with “F.D.” expresses on the Frankfurt and Munich lines; Halle, for example, is 100.4 miles from Berlin, but the distance is covered in 91 minutes down and 93 minutes up; and Leipzig, 102.2 miles, has a 95-minute run from Berlin, and return runs in 96, 103 and 104 minutes. There are many other journeys in this area booked to be covered from start to stop at 60 miles an hour or slightly over. During recent years the small country of Belgium has made great strides in speed, and has also opened new lines, both to relieve congestion on its main routes and also to permit of acceleration. At frequent intervals throughout the day light steam-hauled express trains cover the 33.4 miles between Ghent and Brussels in 32 and 34 minutes, and the 26.5 miles between Ghent and Bruges in 26 and 27 minutes. Another fast run is from Bruges to Brussels, 59.8 miles, in 58 minutes. The only other European country requiring mention here is Italy. The best expresses between Milan and Venice cover the 166 miles in slightly over three hours, including stops at Verona and Padua, and the distance of 50.3 miles from Verona to Padua is booked to be covered in 52 minutes from start to stop. So European speeds on the railways - in competition with those of the roads and in the air - are rapidly and unceasingly advancing, and one can but wonder, indeed, what will be the speed position no more than ten years ahead. A REBUILT LOCOMOTIVE of the “Pacific” type on the Paris-Orleans Railway of France. This type of engine, which has influenced locomotive development on every railway in France, is used on the fastest booked run in that country, which is made by the “Sud Express”, running from Paris to Spain and Portugal. The express is scheduled to cover the seventy miles between Poitiers and Angoulême in sixty minutes. You can read more on “The Fleche d’Or”, “The Flying Hamburger” “The Rail-Cars of France” and “Some German Achievements” on this website.